Creative has announced it is the latest manufacturer to get into the tablet game, with the launch of the Creative ZiiO 7-inch and 10-inch Android tablets. Creative is boasting that its tablets offer the best wireless audio performance you will get from an Android device and this is all because of the company using its audio X factor – namely X-Fi Crystalizer (restores lost detail from CD ripping) and X-Fi Expand (which brings some added immersion). Other than the audio, the tablets offer up a resistive touchscreen (hmm), which has 16.8 million (7-inch version) and 262K colours (10-inch version) respectively. 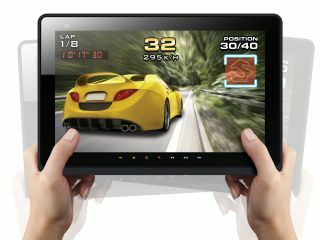 The tablets use Android 2.1 and have Bluetooth capabilities, Wi-Fi connectivity and support for a whole host of audio and video codecs. There is also a front facing camera on board, built in mic, an accelerometer and a microSD card slot. And if that is not all, there is also GPS, FM radio and a composite video-out connection. Both the 7-inch and 10-inch come in two different storage flavours: 8GB or 16GB. The Creative ZiiO 7- and 10-inch have a UK release date of early December and will cost as follows: £199.99 (7-inch, 8GB), £219.99 (7-inch, 16GB); £249.99 (10-inch, 8GB), £369.99 (10-inch, 16GB). TechRadar managed to get its mucky paws on the Creative ZiiO - which is a mite cheaper than the Samsung Galaxy Tab - so stay tuned for our hands on Creative ZiiO review.